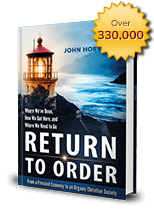 When I wrote Return to Order, I did not imagine it would go so far as it has. To date, I have sent out more than 286,000 copies throughout the the United States, and various other formats across the globe. I and my colleagues have written a number of articles dealing with the present state of affairs, seeking means to bring our country back to God. But it seems to me that this was not enough. Looking at the current state of events, I have often wondered how I and a handful of others could actually affect a true return to order. Then it occurred to me: why not get my readers actively involved in my endeavors by linking our current events with Return to Order? This small introduction is an attempt at this. You will find below a section [or file] of the official Return to Order Study Guide as well as the audio of chapter corresponding to the day’s events. When the recent confusing news about secret Russian alliances in DC, resignations or firing of important figures of the White House and the question of repealing a host of dubious legislation from the past administration, one has a strong sense of a growing cancer that is even harping conservatives: division.